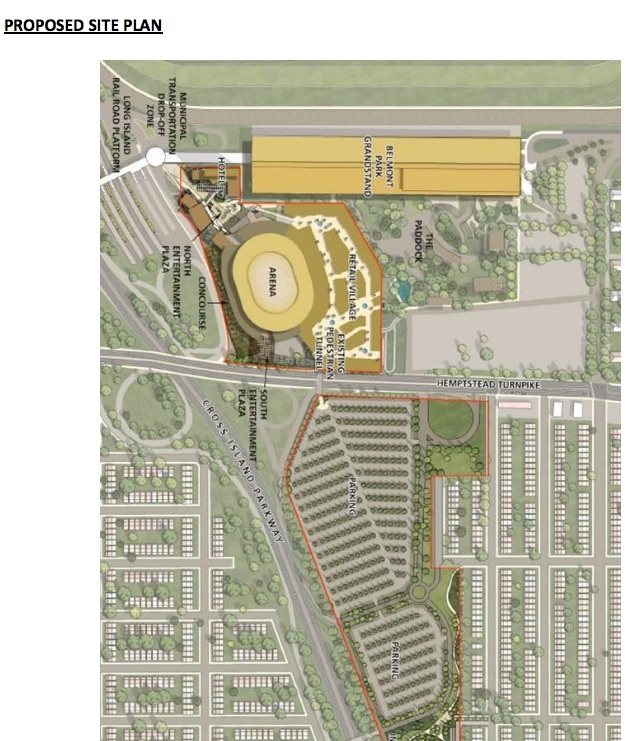 As the approval process for the planned hockey and entertainment arena at Belmont Park percolates, the Village of Floral Park has raised a significant issue--that the process has been much less than transparent--and is using that to request that the bidding process re-start. 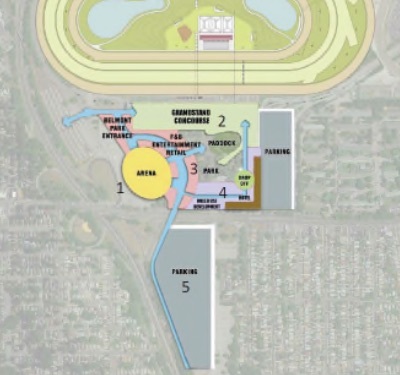 The Village argues that a previously unreleased document shows that, before Empire State Development (ESD) issued a request for proposals (RFP) for land at Belmont Park, the New York Racing Authority (NYRA), which leases the land, was already angling for a hockey arena, before a previous RFP for the site was scrapped. In other words, it looks more and more like a wired deal. That may not be too shocking in the world of New York politics and megaprojects, but it's still a surprise, one that has not--as far as I can tell--generated much notice. Let's see if Newsday, the dominant Long Island newspaper, pays attention; it has editorially supported Belmont and in its news pages not pursued all critical angles; for example, it hasn't covered evidence that a new Belmont arena would likely seriously damage the Nassau Coliseum. This news has been seized on by project opponents. Not long after the New York Islanders' first season at the Barclays Center had ended, and just three weeks after new owners Jon Ledecky and Scott Malkin took control of the team, Newsday, on 7/22/16, reported, "Islanders eye Belmont Park as site for possible new arena, sources say." At around the same time, the Islanders were also said to consider a site at Willets Point. The New York Islanders are in discussions with state officials about building a new hockey arena at Belmont Park in Elmont, a move that would bring the team back to Nassau after they left to play in Brooklyn last year, according to sources familiar with the negotiations. The sources confirmed that the team’s new owners have met several times in recent months with officials of the New York Racing Association, which runs Belmont, to discuss a possible new arena. Discussions have centered on a vacant 28-acre parcel covered by Belmont’s south parking lot that the Empire State Development Corp., the state’s primary business-aid agency, put out for bid nearly four years ago, sources said. The site has ample parking, proximity to highways and access to a Long Island Rail Road station. The letters come amid reports that the Cosmos, a franchise that folded in 1984 but was revived in 2011 to play in the North American Soccer League, could cease operations. Behind all this was the Islanders' poor reception in Brooklyn, and the awkwardness of the Barclays Center, where the team had a reported 25-year contract, which offered an opt-out provision after three or four years. Belmont Park RFP cancellation opens door to New York Islanders, wrote Newsday's Randi Marshall 12/12/16. On 7/31/17, Empire State Development Announces RFP for Belmont Park, with proposals due 9/28/17, barely two months later. On 12/20/17, Gov. Andrew Cuomo announced the arena proposal was chosen. In the fall of 2016, just a few months after the Islanders’ ownership had put Belmont in its crosshairs, ESD cancelled its initial RFP process, more than four years after it began. In July 2017, ESD issued a second RFP, which one state elected official and some of the respondents of the first RFP opined was tailor made for an Islanders arena. Here's commentary on that "done deal" from LIBN editor Joe Dowd and criticism from a rival bidder. The documents eventually produced in response to the FOIL request revealed a 60+ page document from [November] 2016 entitled “Belmont Park Master Plan”. The Village is disturbed by the revelation that there has been a previously developed Master Plan for redevelopment of Belmont Park, without any input from the surrounding communities, and that this Master Plan was in existence, yet undisclosed, prior to the commencement of this RFP process. Floral Park has long called for the development of a Master Plan for Belmont Park to guide development in an appropriate, measured way that not only enhances local and regional economic development but also protects the unique character of the communities surrounding Belmont Park. Floral Park had assumed that such a plan had never been developed. FOB’s FOIL response shows that, in fact, one had been developed but it had never been disclosed to, or vetted with the public. 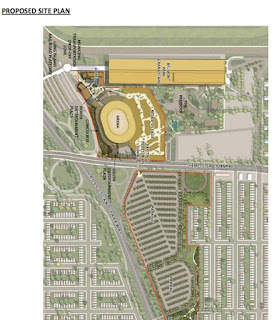 Even more shockingly, the plan which contains multiple NYRA-related improvements also includes all of the major components of NYAP’s proposal including the development of a nearly 19,000-seat arena that would be the future home of the Islanders hockey team. Long before ESD issued the RFP for the Belmont Development Project, NYRA was floating the idea of an arena. Second, the arena was specifically contemplated to be the new home for the New York Islanders. Third, the Islanders architects were working with NYRA’s consultants on the design of the arena. Fourth, there is a clear indication that the State officials who received Kay’s email would have understood his reference to sketches “previously prepared by Ewing Cole.” This indicates this was not the first time the Master Plan had been floated with State officials. 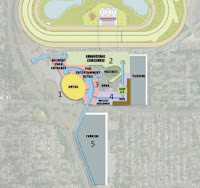 This is virtually confirmed by Master Plan itself because the footer includes the following text “Belmont Park Master Plan Update.” The Master Plan clearly had been under development for some time. Indeed, while the graphics are of different scale, they describe similar projects. November 2016: NYRA sends a “Master Plan” update to the State. June 2017: Eight months later the FOB adopts a resolution stating that FOB desires to “explore opportunities to develop” the Belmont parcels and requests ESD to issue an RFP – on behalf of FOB – for that purpose. See Exhibit 2. July 2017: One month later ESD issues the Belmont Park Redevelopment RFP. December 2017: ESD selects the NYAP proposal which mirrors the non-NYRA specific elements of the NYRA Master Plan.